The Ford F-150 is a powerful vehicle, ready to do anything. It’s a leader in its class in many regards, and that’s evident by seeing how many have chosen to go with the F-150 for their full-size pick-ups. Built with military-strength aluminum alloy, the truck is strong enough to haul your cargo wherever you need to go. This aluminum alloy has been developed to be rigid and hard yet lightweight at the same time. As a result, the truck is more efficient than it has been in the past. When you want to head off-road, you can shift into four-wheel drive by simply turning a dial. 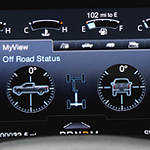 The electronic shift-on-the-fly (ESOF) system will change things over depending on your driving conditions. If you’re intrigued by the idea of driving a Ford F-150 around town and beyond, visit us at Barber Ford. You’re welcome to take one for a test drive and to ask us any of your questions.